A FRACTION TOO MUCH FUSION? 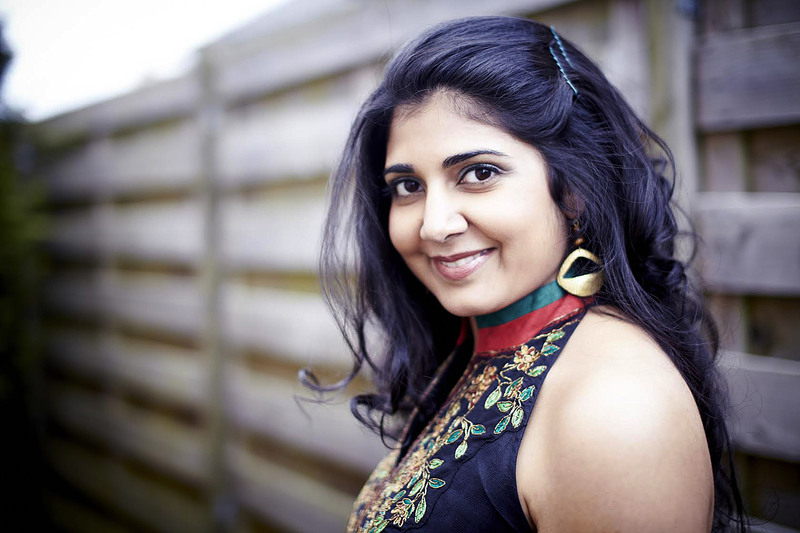 Kavita Shah will perform at Uptown Jazz Cafe on Monday, June 5, at 7.30pm as part of the Melbourne International Jazz Festival. 1. Saxophonist Steve Wilson says you are fresh and unique, a breath of fresh air, and that your music is hard to categorise, genuine and original. How would you describe your music to people in Melbourne? Is it useful to have categories in music and does yours fit a genre or genres? My music is deeply rooted in jazz harmony and improvisation while also incorporating influences from many musical cultures, especially West Africa, Brazil, and India. As you might imagine, I’m not too keen on using labels to describe music, especially when dealing with so-called “world music” which is itself a problematic coinage. Genres, by definition, are exclusive and lack nuance. My music, by creating a creative space in which many different cultural traditions can come together in dialogue, aims to impart a spirit of social inclusion to the audience. 2. Lionel Loueke says you are a great singer, but when you write music you are thinking not only about voice, but how a trumpet or saxophone will feature in the piece. Have you been composing throughout your time as a musician? Composition is still a new process for me, but in some way or another, I’ve been writing my whole life. I come from a family of book publishers, and my dad was a talented writer so growing up, I explored a lot on pen and paper — through journalism, creative writing, poetry, and songwriting. I began composing music in graduate school at Manhattan School of Music, where we were encouraged to really find our own voice in approaching jazz. I began to arrange standards, and over time, my arrangements grew more and more ambitious to the point that I was really composing with pre-existing material. That gave me the confidence to write more of my own music. Right now, I think those two threads — writing stories and writing music — are coming together in my compositions. 3. How important is composition to you compared with being a vocalist? I have been thinking a lot about this question lately. Being a vocalist — focusing on my instrument and my technical craft — has definitely been at the forefront of my practice until now. But I’m in a phase of transition where I’m starting to approach music as a composer first, both in terms of writing music and on a larger scale of designing projects, sets, performances. I feel a calling not only as a musician but as a global citizen to create art that makes an impact on how people think and feel, and composition is an important tool to achieve that end. 4. Do you regard the voice as one instrument among many, or is it different? 5. Your debut album, Visions, had its genesis when you studied at the Manhattan School of Music. Before this period of musical education, how did you come to love music and what teachers helped you along the way? Were your parents’ tastes or any particular teachers especially significant? I have been singing for as long as I can remember. I studied classical piano and at the age of 10, joined the Young People’s Chorus of NYC, where I was first introduced to jazz. My conductor, Francisco Núñez, definitely had a big impact on my life; he established a choir of diverse singers from all ethnic and socio-economic backgrounds, and chose repertoire that ranged from opera to gospel to folk music in 20+ languages to contemporary works by composers like Meredith Monk and (Australian) Elena Kats-Chernin. My first voice teacher, Dr Cara Tasher, was also a very positive influence, teaching me classical technique while encouraging me in my exploration of contemporary repertoire. And of course, Sheila Jordan was my first jazz teacher who inspired me to really pursue a lifetime in music. 6. What attracted you to jazz? I got into jazz through Ella Fitzgerald. My choir sang her song A Tisket, A Tasket, and I was mesmerised by her voice. On a visceral level, I’ve always been attracted to rhythm, so I think the syncopation in jazz spoke to me. On an emotional level, I was attracted to jazz for its sense of freedom. It’s an art form that is inseparable from the history of racial discrimination in America; as a person of colour who encountered prejudice because of my ethnicity, I found in jazz a sense of belonging and cultural lineage. 7. You’ve said that you avoid having the band play a particular style of music, such as Indian or African or Brazilian or jazz, because it is all music and all part of a whole. Can you explain what happens when the various instruments and the cultural heritages in which they have traditionally been used are given the chance to come together in that way? Is the outcome taking the listener, whatever their cultural backgrounds, to new places altogether? Yes, exactly. I don’t believe jazz or classical music is superior to any other form of music, and I think we have a lot to learn from folk traditions. By constructing a landscape in which these diverse elements can come together on a level playing field — a place where my ancestors from Gujarat can come to life alongside inhabitants of a Brazilian favela and jazz elders in New York, each on their own terms — I’ve found that there is a beautifully organic dialogue that can take place. The listener, regardless of background or musical taste, is very much a part of this dialogue, and hopefully gets transported by it somewhere beyond the scope of his or her own reality. 8. Is the music largely improvised or are their detailed charts? Are the musicians drawing from and contributing to the others as they listen and respond during these pieces? My charts are fairly detailed, but with open sections dedicated to improvisation. It’s a delicate balance between letting the music breathe, part of which means not imposing rigid boundaries, and eliciting a specific sound that I hear as a composer. I ultimately want the musicians I work with to feel free to explore in the moment, and respond to whatever that moment demands, which could be going completely off course, while also respecting the intentions behind the composition or arrangement. 9. You draw on the music of Stevie Wonder, hip-hop artists, Joni Mitchell, MIA and Wayne Shorter — people you say wouldn’t normally be brought together at the dinner table. How does this fit alongside the variety in cultural backgrounds and instruments of your band members? The musicians I work with are usually very diverse and versatile — not just in terms of nationality but also in terms of their musical backgrounds. Balance is certainly very important for my music, because I need to create a space where all these different musical elements can come together on equal footing. If the rhythm section is too oriented towards one type of music, the music also becomes lopsided. 10. Is there a danger of too much fusion? The word “fusion” is very misleading because it presumes that the music we already know and love is not derivative in some form or another of various other threads. Isn’t jazz itself the definition of “too much fusion”? Was Charlie Parker a fusion artist because he was influenced by Stravinsky? The world we live in is a world of “too much fusion,” one in which we are all interconnected and migration — by choice and by force — is a constant. On the road, I am always struck by the scope of jazz today, which really reaches across continents and cultures. My music, rather than merely appropriating traditions into my own melting pot, very much reflects the complex yet fluid realities of our global generation. 11. On your tour of Australia you’ll perform with Steve Newcomb. Tell us about your collaboration. How will you approach these concerts touring with Australian musicians? Steve and I met as graduate students at Manhattan School of Music, and we have since collaborated together on several projects, including my album Visions and Steve Newcomb Orchestra’s Caterpillar Chronicles. We just recorded SNO’s second album, Meltwater Pulse, which will be released this year. Steve is a brilliant pianist and composer and playing his music. We’ll be playing with local bassists and pianists in each city, many of whom are friends whom we have worked with before (Sam Anning & Ben Vanderwal in Perth, Ross McHenry & Angus Mason in Adelaide, Oli Nelson & Max Alduca in Sydney, Helen Svabeda & Aaron Jansz in Melbourne, and Sam Anning & Sam Bates in Melbourne). My thanks to Kavita Shah’s hard-working and effective publicist, Amanda Bloom, for arranging this Q&A. Readers may also wish to read the musician’s responses to other questions at AustralianJazz.net. Our perpetually smiling (currently caretaker) Prime Minister Malcolm Turnbull has exhorted us to help make this country “agile”, by which I have taken him to mean that we must be readily adaptable to all sorts of changes … such as “no cuts” meaning lots of cuts, or copper wire NBN rather than fibre, or jobs’n’growth being without penalty rates or superannuation. 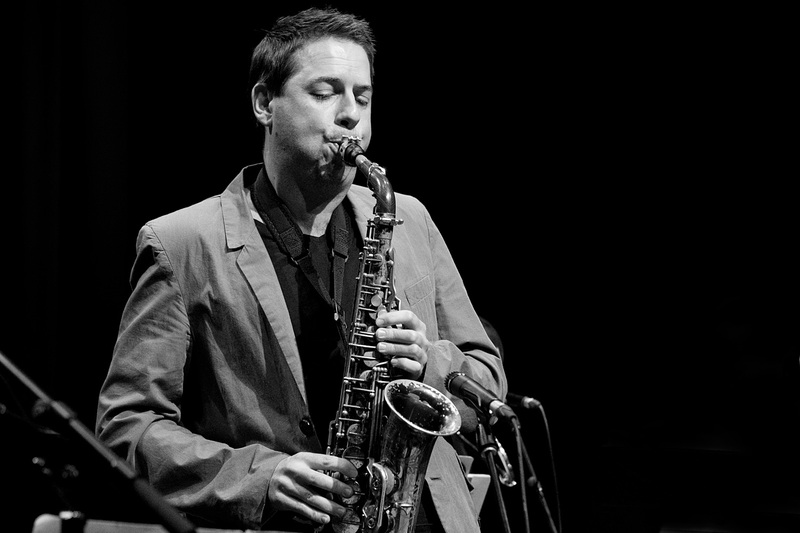 But you may never heard more agile saxophone than Tim Wilson‘s on the new album, Consider This, that he and Andrea Keller will launch tonight at Uptown, presented by the Melbourne Jazz Co-op. And you may never have a more satisfying union (that’s to upset Malcolm) than this unity of piano with reeds. Recorded live at Bennetts Lane in 2015, it features seven original compositions, captured in all their raw beauty. Here’s some video footage from the night of the recording. Consider This is available through Bandcamp. Bassist Chris Hale will join the duo for the second set. Keller and Wilson say their project was “conceived in 2007 out of a mutual respect and love for open, interactive music making, and a desire to create and explore original compositions and improvisations in an intimate duo format”. These musicians met when they were studying at Victorian College of the Arts and have been performing together for over 20 years in ensembles such as the Paul Williamson Sextet and the Bennetts Lane Big Band. 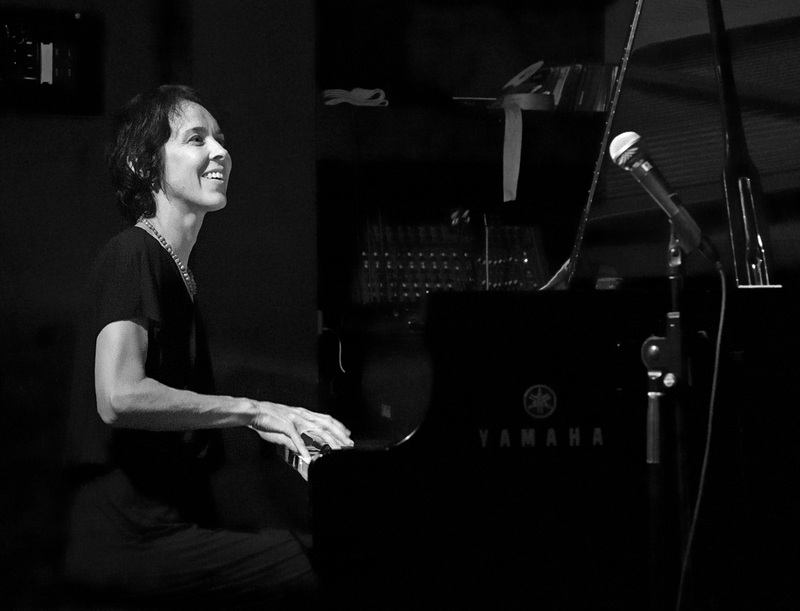 Keller is a three-time Aria Award winner, recipient of the Freedman Fellowship and also the Don Banks Fellowship. Wilson was a finalist in the 2006 World Saxophone Competition (held at the BBC Jazz Festival in London), the 2009 National Jazz Awards, and runner up in the 2013 Taichung Saxophone Competition. Only a limited number of albums will be pressed because the musicians are focusing on releasing the recording digitally. 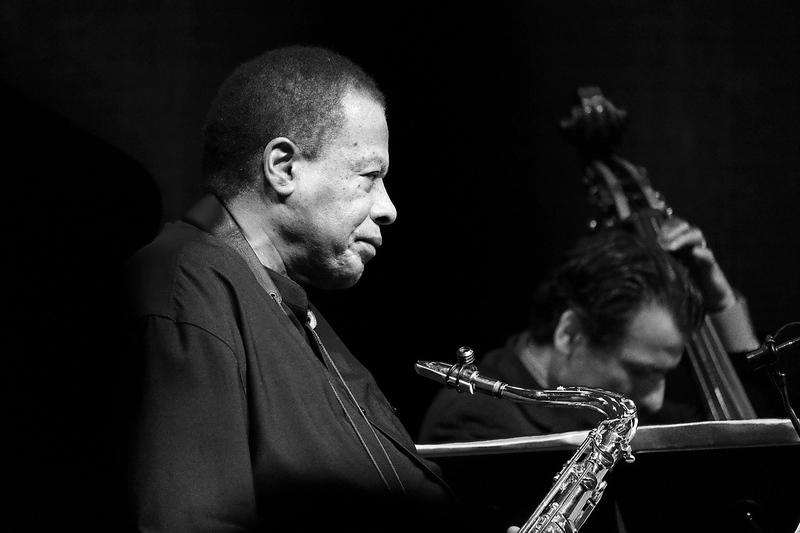 Wayne Shorter at Hamer Hall … surely one of the jazz heroes. One of the most interesting conversations I’ve had during this jazz festival — and I’ve had a few, before and after attending 15 concerts — was about the jazz hero. The person I spoke to was a musician who said he wanted to move away from that approach or model in bands in which he played. In this context I recalled a wonderful concert in Melbourne in which a band gradually swapped players while the music continued, morphing into a new group as newcomers quietly joined in and then others moved off stage during the set. On the second night of this festival, June 4, I went to The Reverence Hotel in Footscray to hear 30/70 Collective make “future soul and hip-hop meet in the middle via jaunty boom bap”, to quote the program. As they say in some news programs, more on that story later. After the first set by members of the collective who formed A Brother Scratch, the 30/70 Collective band members did something I have never seen before at a gig — they went into a huddle. 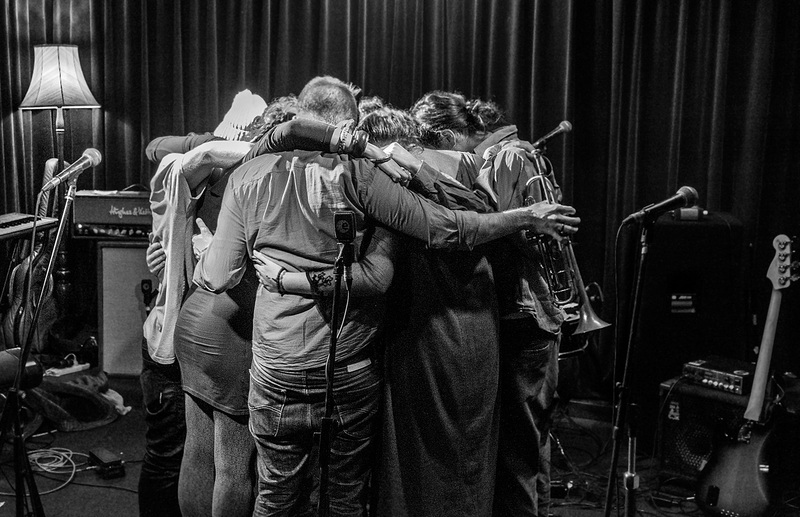 30/70 Collective in a huddle before performing. Already feeling the warm glow from the first set of music that was out of my familiarity zone, so to speak, I was quite taken by this musical group hug, which seemed designed to engender team spirit. It was not long before the packed room was moving to the hypnotic grooves — myself included. By now you’ll have realised this is more of a rave than a hard-nosed review. But there is a point. The musician mentioned who wants to move away from dependence on heroes in jazz described 30/70 Collective as being like a family. That certainly fitted with my impression from the vibes in the pub. I decided to try applying the idea of avoiding heroes to the reviewing of a festival. Bear with me. Reviewers often mention their list of standout gigs or highlights during a festival. I have often done that. And I’ve often asked other patrons and other reviewers to name the bands they’ve most enjoyed. It’s a natural thing, especially if there is limited space in a review, to pick the standouts. But what if a festival review was more like a collective of gigs? Then I could value each for its special qualities — what worked well and even what didn’t. That’s how I feel about the mix of very different MIJF concerts that I went to this year. 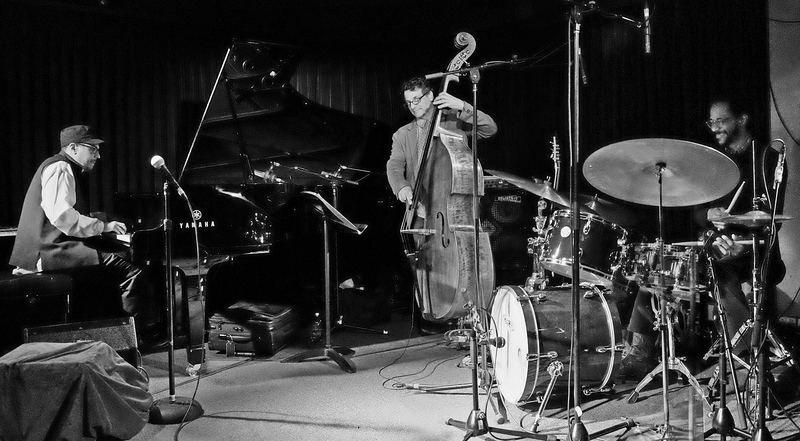 On night eight of the MIJF I went to Bennetts Lane at 10pm to hear Children of the Light Trio consisting of Danilo Perez on piano, John Patitucci on bass and Brian Blade on drums — Wayne Shorter‘s band without the hero, if you like. That’s laughable, you’ll say, because each member of this trio is a hero in their own right. True, but — and I’m already breaking with the “no highlights” approach — that band’s performance without Shorter that night was the gig I’d have to say has stayed with me and will do so for a long time to come. On the final night of the festival I did hear Wayne Shorter with the members of this band. 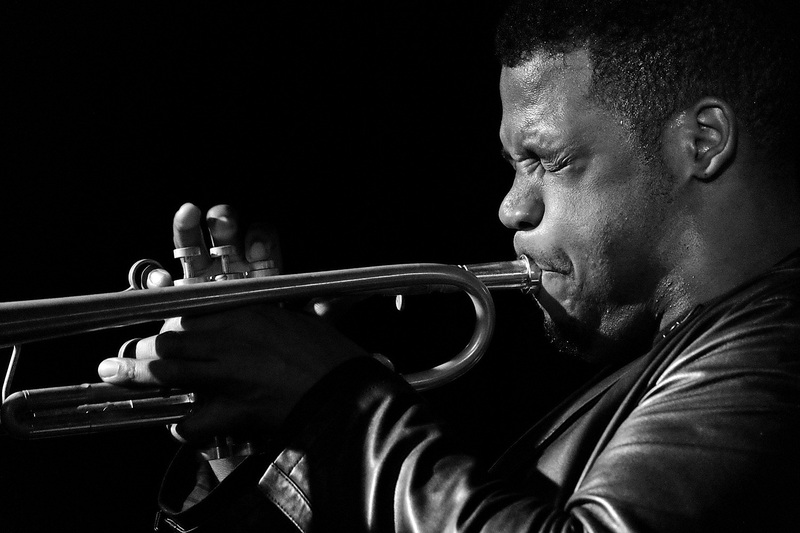 Afterwards I heard snippets of opinion, including comments that he did not play for a great portion of the set, that some say he’s too comfortable with Perez, Patitucci and Blade, and, notwithstanding, that this hero of jazz is on a different plane from any of the great players still alive. Hearing Shorter at Hamer Hall was special. Getting relatively close to record some images was pretty special. Hearing him in conversation with Jon Faine, Wilbur Wilde and Kristin Berardi on ABC radio 774 was also special — and at times hilarious. 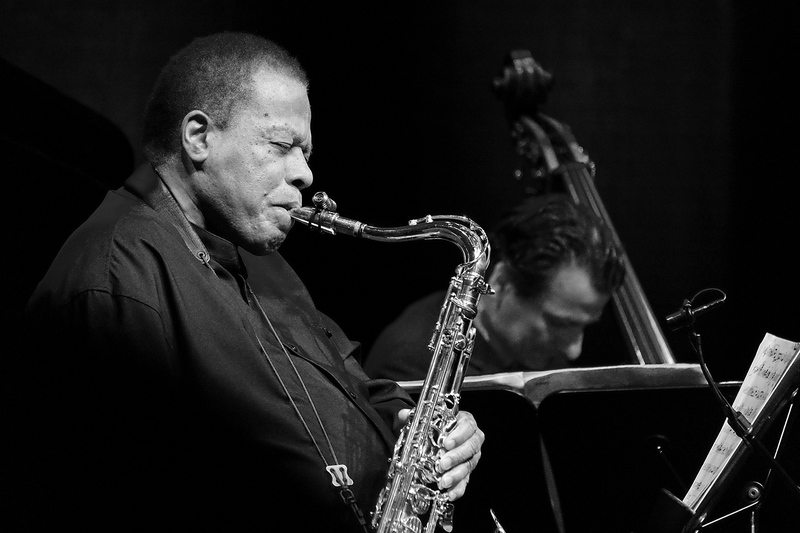 His refusal to get bogged down by labels and his wish to think so broadly about life made me wonder whether Wayne Shorter would want to be put on a pedestal. I enjoyed his playing on this occasion a lot more than when I heard him some years ago at The Palais in St Kilda, which is perhaps a sign that I had then been uneducated in what to expect — frequent changes of direction and very short bursts of sax. This time he did not play for too long in the set, but what he contributed was considered and just right in the moment. That said, after reflection, I took more away from his quartet members’ gig as a trio in the much smaller venue. Of course it would be far too exclusive to have Shorter perform to such a limited audience. Anyway, my search for a hook or a story on which to hang reflections on this year’s Melbourne International Jazz Festival has ended — albeit in way too meandering a fashion — at that strong image of 30/70 Collective in a huddle. To that image I add some showing large ensembles featured at this festival at the ends of their concerts. Stu Hunter and musicians after “the migration” at Malthouse Theatre. 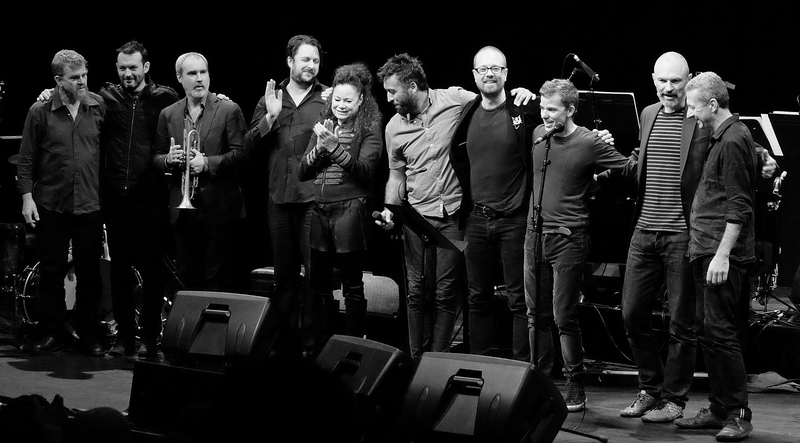 We’ve seen some big projects come to fruition on stage this year — Stu Hunter‘s the migration, the Monash Art Ensemble‘s performance with Tomasz Stanko, the release of a new album by Peter Knight’s Way Out West. All of these have involved a lot of work and huge collective effort. And of course in smaller ensembles such as Andrea Keller’s Transients, the Allan Browne Quintet performing Ithaca Bound at Uptown Jazz Cafe, Keyon Harrold with Twi-Life, Shai Maestro Trio, the Tomasz Stanko Band and the Tribute to Allan Browne trio of Paul Grabowsky, Mirko Guerrini and Niko Schauble, we have heard the results of collective interaction. Even in the solo gig by Paolo Angeli at the Bluestone Church in Footscray we saw how his instrument’s many parts worked together to produce different styles of music. Interaction is what makes the diverse music that makes up jazz so engrossing, inventive and wonderful. And each musician brings to the stage the formative background that has shaped them — influences that interact and find expression in changing ways as they practise and play. Some of us will love, like or not like some of the music we hear from improvising musicians, but at its core is that interaction. We see and delight in it as we watch the faces of the musicians at work. End of rave. In the days ahead I will add a few, much shorter, separate posts — with pictures — to cover concerts I attended as part of this festival. In the meantime, musicians will be playing live in lots of venues around Melbourne, so get out there. You won’t regret it.